My southern California vacation is coming to an end very soon. I’ve been having a wonderful time here seeing my favorite sites and exploring some other pretty magaical places. I can’t wait to share everything with you. 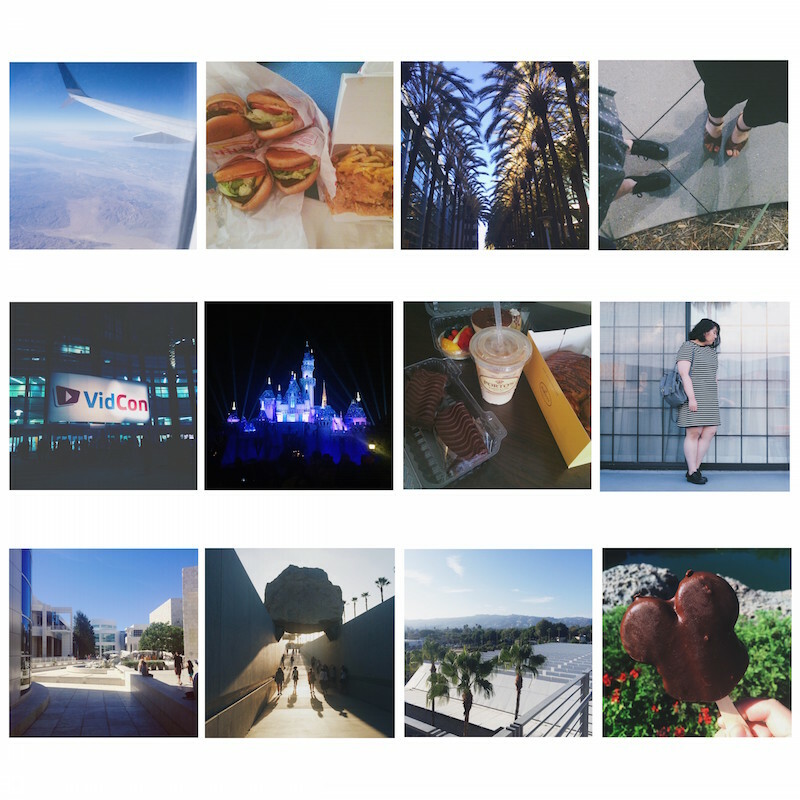 For now, here are some photos I’ve posted on Instagram during my stay in LA. Follow me on Instagram to keep up to date with my life moments. 1. Flying out to Los Angeles. 2. First night in LA always calls for some In-N-Out. 3. Palm trees outside the Anaheim Convention Center for VidCon. 4. Out walking at night with my sister in Anaheim. 5. 6th Annual VidCon officially over. 6. Sleeping Beauty’s Castle at Disneyland. 7. Sometimes I’m a foodie. Had to make a trip to Porto’s in Burbank after hearing only good things. 8. Taking some outfit photos on the sundeck at the hotel. 9. I went to the Getty Museum for the time and it was such a stunning place. 10. LACMA trip to finally see the Levitated Mass. 11. Breathtaking view of LA from a high place at LACMA. 12. Thinking about Disneyland again. It was so hot that the ice cream bar got messy very fast. Hope you all had a beautiful day!